Traditional telecommunications service providers are undergoing a transition to a shared infrastructure in which multiple services will be delivered by peer and server computers interconnected by IP networks. IP transport networks that can transfer packets according to differentiated levels of QoS, availability and price are a key element to generating revenue through a rich offering of services. Automated service and network management are essential to creating and maintaining a flexible and agile service delivery infrastructure that also has much lower operations expense than existing systems. 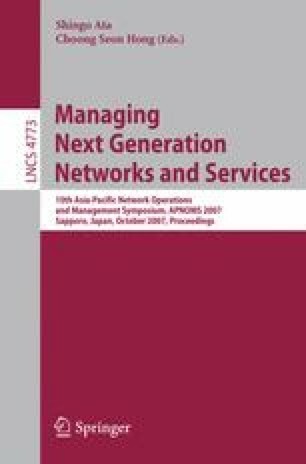 In this paper we focus on the SLA-based IP packet transport service on a core network infrastructure and we argue that the above requirements can be met by a self-management system based on autonomic computing and virtual network concepts. We present a control and management system architecture based on this approach.